Have you tried and failed to get your business covered by the local newspaper, television stations or local radio stations? It’s not hard to get featured in the local press, but there are three rules you must follow to get your business media coverage. Prefer to read instead of watch? Here’s a rough script I used for this video. In this video I want to talk about how to get the local media to cover your business. In my Entrepreneur’s of Sioux Falls Facebook group, I’ve had a handful of people complain that when they call one of the local television stations or radio stations to ask them to cover their business, that the media outlets respond that maybe they should buy advertising instead because their business isn’t that interesting of a story or that they don’t have any news to share. I’ve been featured in the local paper, the local business journal, local online news sites and local television stations several times and I’ve never paid any of them for advertising. Getting the local media to cover your business really isn’t that hard, because they need content for their readers. You just have to use the right approach. First, you need to be interesting and have a story to tell or news to break. 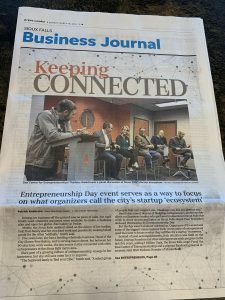 I wanted to get some coverage for 1 Million Cups in the local media because we were having our five year anniversary to see if we could drum up some renewed interest in the event. I didn’t say, “Hey local newspaper/television station, can you write a story about 1 Million Cups?” Instead, I asked the mayor’s office if they would declare March 6th “Entrepreneurship Day” in Sioux Falls and then we could have a whole day about entrepreneurship that promoted both 1 Million Cups and the Zeal Center for Entrepreneurship, which I serve on the board of. Then my pitch to the local media became, “Did you know that March 6th is going to be the first every city-wide entrepreneurship day?” It’s a much more interesting story, and honestly, John Meyer and I just kind of made up the idea and it gave us an excuse to have a big party for 1 Million Cups’ fifth anniversary too. We got our event covered both local business publications and gave us something to talk about on social media for weeks. I’d call it a huge success. So, the lesson from what we pulled off with entrepreneurship day, is that you can engineer news into existence that makes your business more exciting to cover. You could throw a big city wide event. You could get a celebrity to spend time at your business. You could do what we did and get the city do declare a day for you. Your business could win an award that’s newsworthy and it’s really easy to win awards because many business awards are basically pay-for-play. You could show that your business is the largest of its kind in the region, which makes your business and your city look good. It can be even something as mundane as opening a second location of your business. The key is to pitch your business to local media in such a way that it’s part of a larger story that their audience would like to consume. There are two other big things to be aware of when working with local media. First, they are hugely over-worked and under-paid. So, if you can be the person that makes their job easier, you are much more likely to get covered by them. Send them all of the images they need, send them quotes they can use in their story, give them the highlights of your story in bullet points, offer to answer FAQ questions, or even write a press release and send it to them. Sometimes they might just take your press release, tweak it a bit and publish it as a story on their website. Our local paper, the Argus Leader, used to have 75 people that worked there. Now they’re down to about 20 due to the changing economics of the newspaper industry. They don’t have the time or resources to track down many different stories, so you really have to bring the meat of the story to them. Second, relationships really do matter when it comes to media coverage. I’ve worked really hard to develop relationships with the local business press. I’ll send them information about stories that I hear about that haven’t made the paper yet. When there’s part of a story they’re missing or haven’t figured out yet, I might clue them in if I have inside knowledge. It’s usually nothing salacious or tantalizing, but more like, “Hey, I heard XYZ business is moving into the old ABC store space.” That kind of information is helpful to them, so when I have a story to tell in the local media, they’re much more apt to listen. They don’t always cover the things that I ask them to cover, but more often than not, at least a short story will get written. You don’t even have to go that far, it could be as simple as following specific journalists on Facebook and liking and commenting on their stories. Sioux Falls really is a small town, so there’s no reason you couldn’t just track some of them down on Facebook and add them as Facebook friends too. The key is getting them to have some familiarity with you before you ask them to cover your story, because they’re going to give credence to a story that a friend has over a story that a stranger has. So first, make sure that you are approaching the local media when you have news to share. If you don’t have any news to share, make some news up, or wait until you do have news. Second, make it easier for the local media to cover your business. Finally, build relationship with local reporters and journalists so that you’re not a total stranger when you do ask for something. Hopefully this video is help to you guys. If you like these videos, I post them at least once a week on my Facebook page, my YouTube channel and now my LinkedIn account.